• illustrating that negative effects on the environment can be minimized, reduced or eliminated. In the mid 1950s a forward looking group of people in Dryden Ontario recognized a need to provide young people with background and education in the area of resource conservation and management. Management of the local paper mill along with representatives of the mill’s Woodlands Department, the local Board of Education, Dryden High School, and the Department of Natural Resources combined their knowledge and resources to implement the Dryden High School Conservation Course in 1957. Since 1957 The Dryden High School Conservation Course has been an annual event. Students from Dryden High School are provided with the opportunity to spend three intensive days in the field learning key aspects of resource conservation and management from resource management experts. The stated objective of this unique conservation course is “to broaden understanding of resource management and encourage appreciation of conservation concepts while enjoying three days in an outdoor setting”. Hands-on and interactive approaches to learning are encouraged. Key elements for conservation include, water, soil, wildlife and forests. Resource use elements and activities that are presented include water resources, aquatic and terrestrial ecosystems, wildlife, and forestry. Specific elements of forestry include, harvesting and renewal, seedling production, inventory, soils, fire management and protection, and a land use management planning exercise. Over the years, numerous independent volunteers, organizations, local industry and businesses have willing contributed their resources and talents to this program. Without the contribution of these volunteers and organizations, Conservation Camp would not be possible. Domtar provides the resources for program organization and development as well as, professional foresters to act as instructors and mentors during the three day program. These foresters guide students as they learn about harvesting, regeneration, stakeholder values and what it takes to be environmentally responsible in the forest. Domtar also hosts the students to a full day in active harvesting operations. The intent of this program is not to make experts of the students involved but to increase their awareness of resource use and the challenges that are presented in resource management. Interactions between resource uses and users, and the impacts of competing resources, are explored. The program provides students with a strong cross section of resource management and sustainability concepts. 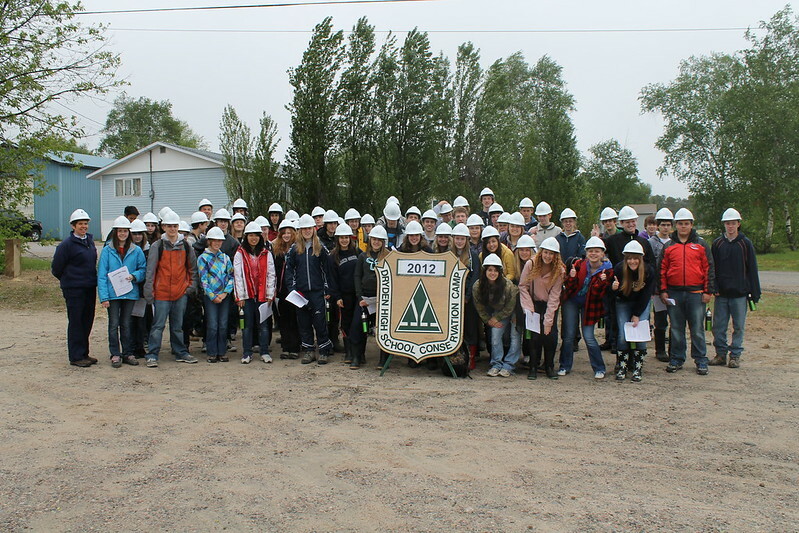 It is worth noting that many of the students who have participated in the Dryden High School Conservation Course have gone on to pursue higher education and careers in the field of resource management. Alumni of the Dryden High School Conservation Course include professional foresters, biologists, ecologist, geologists, engineers, agronomists and many others who have pursued careers in resource management or related fields. What gear should I bring to Conservation Camp? • appropriate footwear (running shoes or hiking boots) NO SANDALS OR OPEN-TOED SHOES! • Bring your own snacks – Litterless is better! Will Conservation Camp be cancelled if it rains? I have allergies to food and/or environmental triggers. Who should I tell? I am a vegetarian. Who should I tell? Let your teacher know in advance so that meatless meals can be provided. Do I need to have a certain overall average to be able to attend? Will I be exempt from my Grade 10 Science End Task? I will be missing three days of classes. What am I responsible for? I have a part-time job after school and don’t want to miss work. Can I participate in Conservation for only one or two days? Each year there are a number of people who work behind the scenes to make Conservation Camp a reality including the instructors you will interact with each day. Please take the time to thank them personally for their time and efforts.